Imagine changing the lives of people from another country, thousands of miles away. That’s exactly what students involved with the QU South Africa program do. The QU 301 Seminar class and the Alternative Winter Break program provide Quinnipiac students the opportunity to help others in struggling communities in South Africa. Professor Peter Gallay facilitates the QU South Africa program on the Quinnipiac side, with support from the Department of Cultural and Global Engagement. As a QU 301 professor, his main goal is to provide insight and prepare students for their experiences in South Africa. “It’s about the Quinnipiac community being able to support a community that is thousands of miles away,” Gallay said. As Simpson assesses the community, she decides what needs to be done and prepares the Quinnipiac professors for their visits. On average, student attendance for each trip ranges from 12 to 20 students, according to Gallay. He said the purpose of the program is not only to provide students with the experience of learning the history and culture of South Africa, but to force the students to think about the differences between the two communities. “The Quinnipiac students are able to interact with people [in South Africa] who are underrepresented,” Gallay said. During the Alternative Winter Break trip, due to the reversed seasonal calendar, students help run a summer camp for students of Vaaijies Primary School. At this camp, Vaaijies students are able to participate in activities ranging from arts and crafts to a game of soccer with both Division I coaches from Quinnipiac. But in order for Quinnipiac to continue to build athletic fields, repair houses and host summer camps in South Africa, money is key, according to Gallay. Despite fears about the initial interaction between Quinnipiac students and Vaaijies students, Simpson said her worries faded after seeing the ways students from both sides interacted with one another. But, much to her surprise, Simpson said the Quinnipiac and Vaaijies students quickly took a liking to each other. The bond developed between these students from different communities is a unique one, according to Simpson. But, of course, it isn’t just students from the Vaaijies Primary School that Quinnipiac supports. The QU 301 and Alternative Winter Break programs help women in Cape Town, South Africa. 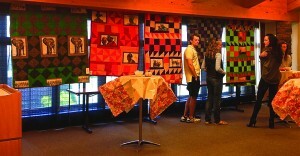 Quinnipiac students help teach the women how to quilt and provide them with the proper materials. In doing so, Quinnipiac provides these women the opportunity to sell their quilts to save money and change the lives of themselves and their children, according to Simpson. Simpson said the impact the Quinnipiac students have on the people in the South African community is everlasting. The departures from South Africa are never easy on either side.